County Kerry’s Gaeltachts is where one revels in the true-blue Irish spirit. Alilting Uilleann pipe ushering in the early morning breeze with an old ballad, the fragrance of green grass, and Gaelic giggles by country girls at Dublin’s verdant St.Stephen’s Green, I am intoxicated by some of life’s most sublime gifts! When in Dublin, I am reminded of a famous couplet by legendary Arab poet Al Mutanabbi, “The night and the horse and the wilderness know me, and do the sword and the spear and the paper and the pen”, for by now, every old brown stone in Dublin’s Georgian buildings, every barrel in its old pubs and every redhead tap dancer worth her salt recognise this ‘eccentric Indian drummer’! Heading towards the south-eastern charms, after bidding goodbye to the cobbled streets, all-night musical ‘lock-ins’ and pints of Guinness, I drive south-east of Dublin to the County Wicklow to Enniskerry where stands the Powerscourt Estate, home to some of the world’s most scenic Japanese gardens. 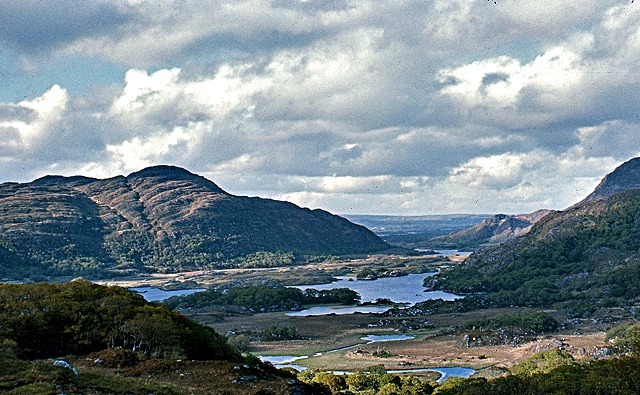 A haven for picnickers, trekkers and honeymooners, the Japanese gardens with a tranquil Neptune Fountain, Japanese-style bridges, groves of trees and a pet cemetery are what I would ideally call Ireland’s very own Eden. Ahead at New Ross, stands Dunbrody, a recreation of the ‘Famine Ship’. Its old-style wooden structure, a towering mast and mezzanine bunkers where an old granny recreates the plight of the refugees that once sailed in it are an astounding déja vu of Ireland’s history. I further drive down to Wexford to behold stunning views of the Irish Sea atop the Hook Lighthouse, and goose pimples it was, as the lighthouse keeper's granddaughter narrated tales of old. I further started discovering western Ireland. County Kerry in western Ireland unfolds a world of enchantment with its scenic lakes, old Gaelic villages and the forbidding Ring of Kerry. After a hearty Irish breakfast at a wayside café in the town of Killarney, I head to the Lakes of Killarney. At Ladies View, I immerse myself in the stillness perched high on a rock overlooking the lakes. At the Killarney National Park stand Muckross House, a 19th century Victorian mansion and the 15th century Ross castle where legend has it, that the O’Donoghue chieftain who inhabited the castle was sucked away by a monster that disappeared into the lake! County Kerry’s Gaeltachts is where one revels in the true-blue Irish spirit. At Dingle, a tiny, quaint Gaeltacht, I am charmed by the array of colourful pubs, a small fishing harbour, music shops and its affable folk. The earthy twang of Ireland’s ancient Gaelic language was music to my ears as I listen to a group of burlesque fishermen narrate legends of old in a pub nearby. “Go n'éirí an bóthar leat!” ( Gaelic for ‘bon voyage’) they growled wishing me luck for my onward journey into their enchanting land. Humming an old Gaelic Sean Nos tune I had learnt as a teenager back in Galway, I cycle down to the mystical Ring of Kerry to behold some of the most breathtaking views of the raging Atlantic crashing on the 90 degree cliffs, with a blanket of grey clouds settling on the turquoise blue waves with nobody except a camera and a lone seagull for company! Manoeuvring through a rocky terrain, I make my way up to a deserted cave monastic site and meditate, looking through the only window in the cave overlooking the endless expanse of the ocean, like looking through the window to eternity! One can get around Dublin by taxi, bus or the ‘Luas’ tram service. Walking is a great way to explore the city. Driving along Ireland’s scenic motorways is fun and a great way to reach various places in Ireland. The country also has a wonderful intercity train service. In Dublin, one can enjoy pub-hopping, traditional music, drinking Guinness or Irish whiskey, the Chester Beatty Library, Trinity College, Irish Museum of Modern Art etc. County Wicklow is about two hours by road from Dublin while to County Kerry by road takes about four hours.